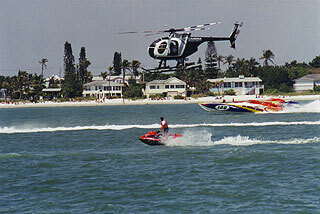 USSAR provides the rescue services for many of the Offshore Boat Racing events throughout the U.S. 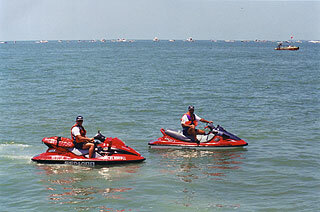 In this photo, Our Operations Commander monitors the start of the Open Class race in Fort Myers, Florida. 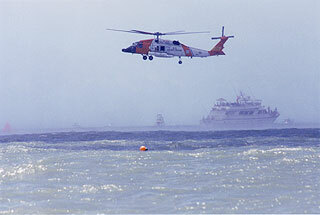 Each Rescue Tech is trained and equipped to remove the Driver and Throttleman from a vesselÃ‚Â that has flipped over by removing the victims while utilizing Spare Air cylinders. 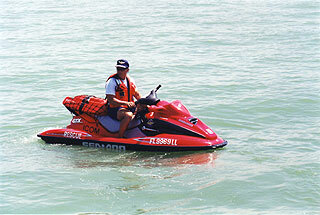 The Rescue Tech's must remain alert and ready to rapidly respond as a Rescue Diver. The crew members are harnessed into their seats and many times are in an enclosed cockpit which makes the removal of the crew more difficult with a hatch, the harness and the victim having to be removed underwater. Many times the crew are unconscious after impact when the vessel is flipped over at high speeds making the rescue a very time sensitive issue. 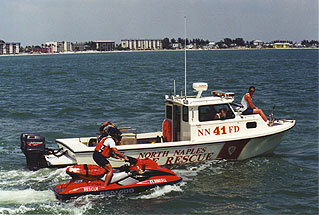 The Rescue Teams and Fire Boats work hand in hand and must be on the same page with their rescue techniques. Always Alert and Ready to Respond. 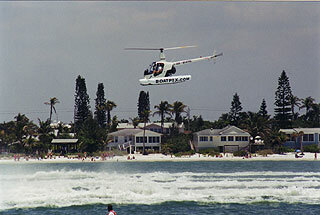 The events are always covered by the BoatPix Chopper. Rescue Techs hanging out between races. 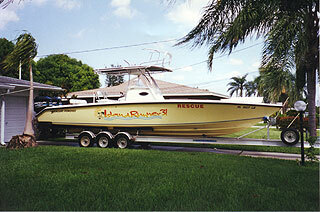 Our Island Runner 31 is a vacuum bagged racing hull designed and built by former racing champion Nick Scafidi. Designed for multiple uses and well thoughtout, this Center Console design is most useful because of the ability to walk around the entire deck and have access to victims from any point on the vessel. 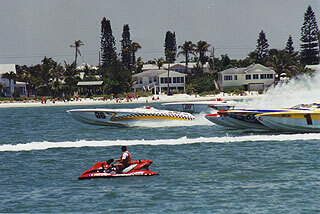 This was a 70mph vessel with twin 225's. Did we mention what a great guy Nick is??? Let it be known!